Flood Safety Awareness Week across the country and in North Texas has concluded. But you'll keep hearing the phrase "Turn Around, Don't Drown" as Fort Worth works to reduce flood dangers, injuries and deaths. Despite clear warning lights and signs, barricades and obvious water over the road, some drivers still took a risk crossing roadways in northwest Fort Worth in late January. Fortunately, no one was injured. "People tend to forget how dangerous it is and don't make wise choices many times," said Greg Simmons, Fort Worth Storm Water Management director. Spring storm season is right around the corner and as Flood Safety Awareness Weeks comes to an end, Fort Worth discussed how it is spending a billion dollars worth of storm water improvement projects. 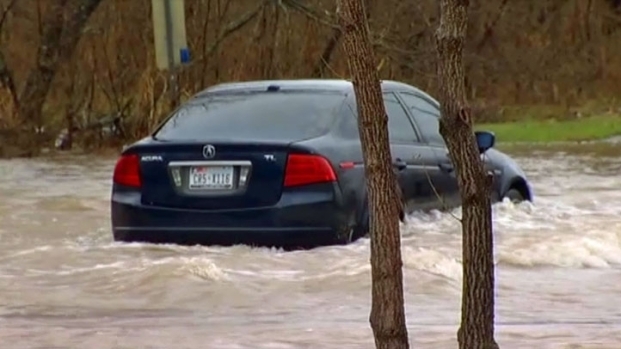 The city said it will keep driving home the message of "Turn Around, Don't Drown." It is also working on several projects to reduce dangers and damage in flood-prone areas such as an area near Eastern Hills Elementary School. "One of the techniques you try and find is an area where you can get the water to go where it's not a threat," Simmons said. "That's what this project is all about." The vacant land next to the school is being turned into an athletic field when it's dry and a retention pond when there's heavy rain and flooding. "And then, after a while, it drains back out, dries out and again becomes an athletic field," Simmons said. The city has identified $1 billion worth of storm water improvements and raised rates this year to pay for more projects in flood-prone areas. But the city still needs the public to know the dangers, even if they've heard it before. "Education is one of the biggest things we do, and so we try many, different ways to get that message out, over and over again, repeatedly," Simmons said. The Eastern Hills Drainage Improvement project will also include pipe and inlet improvements that should keep water away from flooding homes and the schools in the area. Drowning is the most common flood-related death and more drownings happen in cars than any other location.